Lal Akash is a family-run Indian restaurant in the heart of Cheam Village. Lal Akash offers an impressive array of traditional spices and modern interpretations of classic Indian dishes. 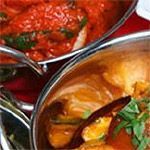 A good Indian restaurant in Cheam Village that’s run by a team of hard-working friendly chaps who make a concerted effort to know their customers and exactly what they want. Lal Akash is situated a stone’s throw from the train station and benefits from a relative abundance of parking spaces along the high street but sadly it’s also a hair’s breadth from another Indian competitor (next door but one) and a hair’s length from yet another, so custom is split somewhat. This place, however, holds its own and knocks the socks off its neighbours when it comes to the food. The restaurant is small and therefore intimate which suits a date or a low-key meal, but as with most curry houses it's a good spot for a large party of friends. The service is second to none. The most important piece of the jigsaw: the food. It’s authentic and they do their best to accommodate your whims, such as a request for a bone-in chicken jalfrezi, or one to try the staff kitchen curry (which is very good). But back to the menu. It’s full of the ubiquitous classics (baltis, biryanis, dansaks, madrases), but the lamb jalfrezi (£7.95) is marvellous - perfectly spiced and laden with slivers of green finger chillis. The Nepal kalio (£9.95) is hot and cooked in yoghurt with potatoes and spices, but for something a little milder (but still exotic), try the begum bagaar (£9.95), which is creamy yet spicy and fragrant - a thinking man’s korma if you will. Butterflied tandoori king prawns (£13.95) or grilled marinated lamb chops (£11.95) are also worth splashing out on, especially if you want to get stuck in with your hands. The phall, despite being a very spicy challenge, even tastes good. Garlic naan is thin and embedded with shards of garlic, whilst the kadaki naan is adorned with finely chopped red onion (£2.75). Mushroom rice or roshon rice (again, adorned with garlic - both £3.50) soak it all up nicely. The tarka daal (£3.75) is buttery and a garlic overload (as it should be) and the saag paneer (cubes of salty cheese and comforting creamed spinach - £3.95) is the best one around. A fully loaded bar allows you to opt for a civilised wine, a cooling beer, a refreshing G and T, a drunken Disaronno or a recovery glass of milk at reasonable prices. A (perfectly fine) bottle of house wine is just £13.95 small/large Cobras are £2.95/£4.50. This place deserves to do well and hasn’t succumbed to simply Anglicising Indian food for the masses. The staff are charming and the atmosphere good, in a venue that's a good shout for a Ruby on the outskirts of London.